Just regular folks. 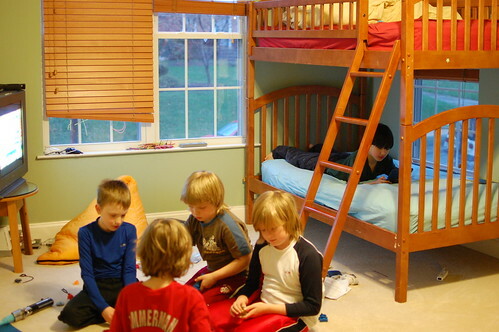 : Slumber party on Wed night! Crazy. 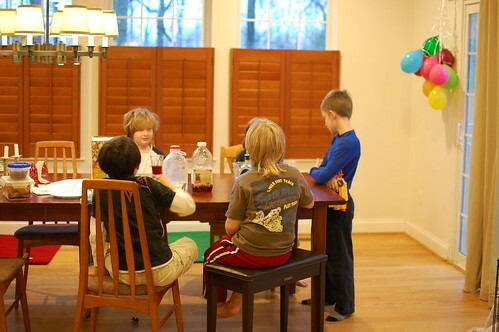 Vince has wanted to host a slumber party for a while - so since there was no school today because of a professional day for teachers, we hosted a party of FIVE. There was a lot of DS-ing, a lot of Bayblade-ing and a lot of wrestling. Everyone got along, so no arguments, no slapping. Apparently the use of PJs is already out of style in the third grade, sleeping in one's underwear is the way to go. The only misstep was that at 3:30 am when Jeremy was answering Edda's nightly seizure call, he found three boys still bathed in the glow of tiny computer screens. Sigh. We should have taken all the electronics away at lights out. Must remember that tip for next time. Bed heads all around after 3.5 hours of sleep. They are the easiest crowd to feed - pizza (cheese), Kraft Mac and Cheese (don't try to slip in Annie's mac and cheese) and some frozen waffles in the morning. Of course, 2 hours after everyone left, Vince spiked a fever and is asleep. Exhaustion.